The Centre was launched by Nobel Laureate J.M. 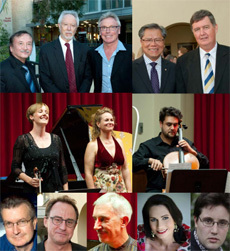 Coetzee, and the evening featured the world premier of Graeme Koehne’s and Peter Goldsworthy’s complete Ringtone Cycle, performed by the Seraphim Trio and Lisa Harper-Brown [soprano], and a recital of Holderlin songs, performed by Robert MacFarlane [tenor] and Stephen Whittington [piano]. Stephen also gave a world premiere of his Nocturne for Piano, one of a set of three works inspired by Holderlin’s Night Songs.